Dandoy Régis, Dodeigne Jérémy, Reuchamps Min, Vandeleene Audrey, « The new Belgian Senate. A (dis)continued evolution of federalism in Belgium? 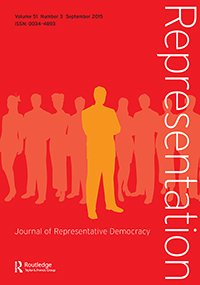 », Representation, vol. 51 (3), 2015, pp. 327-339. The 2012–14 reform of the Belgian state has deeeply transformed its Senate. Not only does the reform reduce the legislative powers of the Belgian upper chamber, but it also alters its composition. The former appointment of Senators based on a system of direct and community-based election is replaced by a system of indirect and mixed regional and community-based designation. This article presents this important reform. On the basis of a comprehensive dataset of federal and regional political careers, it also comparatively analyses the profile of the Senators, before and after the reform. Overall, although rules regarding seats allocation have been thoroughly remodelled, we conclude that the reform had neither dramatically affected the subtle balances upon which the Belgian federal state relies nor altered the patterns of Senators’ profiles.